What are Normal Temperature Ranges? What Pulse Qualities are Assessed? How is Oxygen Saturation Measured? What are Normal Oxygen Saturation Levels? Why is Blood Pressure Measured? What are Normal Blood Pressure Ranges? How is Blood Pressure Measured? What Should the Healthcare Provider Consider? The normal rectal temperature is usually 1ºC higher than oral temperature (OER #1). A rectal thermometer has a red end to distinguish it from an oral/axillary thermometer. 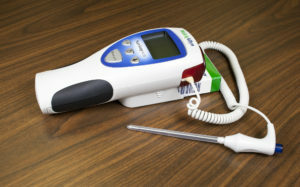 A rectal thermometer is shown in Figure 2.7. First, ensure the client’s privacy. Wash your hands and put on gloves. For infants, lie them down in a supine position and raise their legs up toward the chest. You can encourage a parent to hold the infant to decrease movement and provide a sense of safety. With older children and adults, assist them into a side lying position. Remove the probe from the device and place a probe cover (from the box) on the thermometer. Lubricate the cover with a water-based lubricant, and then gently insert the probe 2–3 cm inside the rectal opening of an adult, or less depending on the size of the client. The device beeps when it is done. Measuring rectal temperature is an invasive method. Some suggest its use only when other methods are not available (OER #1), while others suggest that the rectal route is a gold standard in the infant population because of its accuracy. The Canadian Pediatric Society (Leduc & Woods, 2017) has referred to research indicating that rectal temperatures may remain elevated after a client’s core temperature has started to return to normal, but after reviewing all available evidence, still recommends measuring rectal temperature for children under the age of two, particularly when accuracy is vital. Rectal temperature is not measured in infants under one month of age or premature newborns. Rectal Temperature by Ryerson University is licensed under a Creative Commons Attribution 4.0 International License, except where otherwise noted.